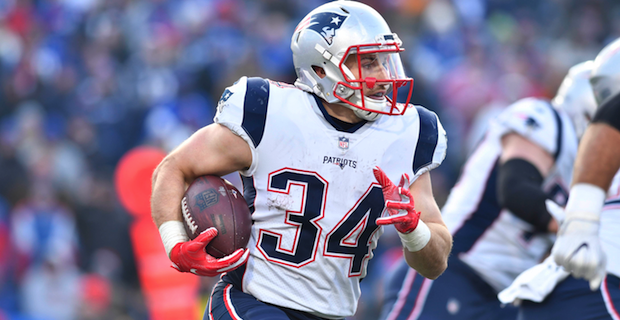 Rex Burkhead decided to double-down on his time with New England, showing that he's a-ok with the Patriot Way. After one season with the club in 2017, the Patriots running back hit free agency and had the rest of the NFL in front of him. After a season where he showed his versatility as a runner and pass catcher in New England’s offense totaling 518 combined yards and eight touchdowns, he likely could have carved himself a nice spot with someone else if he so chose. Instead, he decided to come back to Foxboro inking a three-year contract with the club worth $9.7 million earlier this offseason. While a player re-signing is hardly an uncommon occurrence in the NFL, it's newsworthy in the sense that the Patriots are in the midst of an offseason where stones have been thrown at their dynasty for how their militaristic culture operates. Eagles lineman Lane Johnson has been one of the louder NFL figures bashing the Patriots this offseason, but just recently former Pats linebacker Cassius Marsh also elected to rip the organization for how much he "hated" his time with the team. That report was later followed up detailing a halftime tirade the linebacker went on during a Patriots blowout of the Raiders down in Mexico City after playing in just two snaps. While some NFL-ers have decided to condemn playing in Foxboro, Burkhead has embraced it. In fact, he told Henry McKenna of Patriots Wire that it was the winning culture that drew him back there this offseason. And it's that type of mindset that the Patriots must scout when looking to bring players in. While every team will look for players of specific skill-sets to fit their scheme, New England must be even more careful about what kind of player is coming through those doors. If they've shown signs that they can't handle their way of coaching, you'll likely get a Cassius Marsh-like result. If they nail it, you're looking at a player in Burkhead, whose only mission in 2018 is to do something that the Patriots have been able to do better than every other team in the NFL over the last two-decades: win.